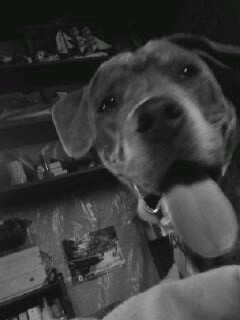 I got my best friend December 26, 2008. He was the runt of 11, and was half the size of his brothers and sisters. He is now a healthy 61 lbs. 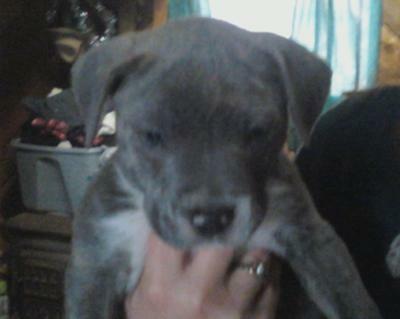 He is blue brindle with a white chest and paws. His favorite toy is a tennis ball, and he can play fetch for hours. I have never seen a dog play catch so well. His favorite thing of course is kissing the people he loves, especially my 5 month old son. Connor loves him too. Sometimes I think Blue is too smart. He keeps me on my toes. If he doesn't get attention sometimes he will act up, but it's never anything bad. He will push the garbage lid up to make a noise. He likes going on walks too. He is the best dog I have and probably will ever have!